There is at present a growing recognition among corporate leaders that corporate governance has to be based on an enduring ethical foundation. But most of the corporate debate on ethics is focused on rules, conduct, law and behaviour. In a deeper perspective, all ethical conduct and behaviour, to be authentic, sincere and lasting, have to be based on an ethical consciousness. The soul and core of ethical consciousness is internalized values. This article presents an approach to corporate governance based on building a corporate consciousness guided by the values of our higher nature. This brings us to the question what are the values which can lead to a lasting, authentic and intrinsic ethical consciousness? They are those ideals and standards which are in harmony with higher nature of human being and the higher evolutionary laws of Nature. There is a higher nature in us beyond our physical, sensational and lower emotional being; it is the nature of our higher mind, deeper emotions, nobler ethical-aesthetic being and above all these, our spiritual self which is the deepest and inner most core of our being. This greater nature in us is the source of all the higher aspirations and values of humanity which includes all the higher ideals discovered by the intuitive, religious and spiritual wisdom of humanity like for example, truth, beauty, goodness, harmony, freedom, equality, interdependence, wholeness, unity, oneness of all existence, and ultimately the source of all these eternal verities, the Divine. How to internalize these values in the consciousness of individuals? It requires an education and inner discipline based on the following principles and practices. In decision-making, long-term well-being of people and the larger society as a whole must be placed above the personal ambitions of the leader or the short-term goals of the organization. Constant and vigilant self-observation or mindfulness which is very much necessary to become fully conscious of what we are made of, detect and reject all contradictions and self-deceptions within us and unify our being around our central ideal, principle or value which we want to realize. Conscious cultivation of higher values which lead to peace and harmony within us and with the surrounding environment like kindness, generosity, compassion, service, tolerance, understanding, non-judgemental attitude, patience, forgiveness. Practice of peace and equanimity under all circumstances. For someone who is peaceful and calm is less likely to fall a prey to unethical impulses. Practice of stepping back and witness-consciousness. Learning to step-back and watch as a detached witness all our thoughts, feelings and impulse and to discriminate between the right and wrong movement. Developing the capacity for introversion by which we can enter deep into our inner being and come into direct contact with our divine self. For only, in the consciousness of our spiritual self beyond our body and mind, the higher values become entirely concrete, spontaneous, experiential and intrinsic. However, most of the modern management thinking on leadership is about outer governance or “organizational transformation”. But as the Indian thought repeatedly emphasized self-government, Swarajya is the foundation for governing the outer world, Samrajya. Similarly self-transformation is the basis for outer transformation. Someone who cannot govern himself cannot govern others. And someone who is governing himself with higher values can evoke, inspire and induce a similar aspiration and effort in others. At the collective level the values we have discussed earlier have to be adopted to the actual needs and nature of business or to use the Indian terminology, the unique swadharma of business. What are precisely the values, which can bring out and manifest the dharmic potential of business? We are presenting here the broad outline of a system of values, principles and guidelines based on the higher vision of governance which we have discussed earlier. employee development not only interms of skill, knowledge and creativity but also interms of material, mental, moral and spiritual well-being of the employees. felicitating triune integration: integration of the body, mind, heart, will and action of the individual around a higher ideal or the spiritual core of her being; integration of the personal and professional life of the employee; integration of the material, techno-economic, social, political and cultural life of the organization around its mission, vision and values, which are in turn derived from the higher laws of life or higher aims of human development. creating an effective system of education, discipline and communication for internalizing these values in the consciousness of people and an efficient system of measurement, monitoring and implementation for materializing them in the outer life. And finally when all these values and principles are progressively actualized in the corporate life, profit and shareholder values follow as a spontaneous and inevitable result. Stephen R. Cowey, ‘Peace of Conscience’ Leading with Wisdom, ed. Peter and Kristen Pruzan, Response, 2007, pp. 76-85. Han Fook Kwang, Warren Fernandes and Sumiko Tan, Lee Kuan Yew: The Man and his Ideas, Singapore. The Mother, Collected Works, vol.13, 165-66. 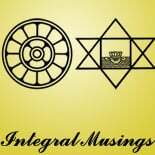 This entry was posted on May 29, 2012 by integralmusings in Integral Management.